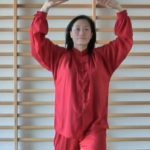 Daoyin Yangsheng Gong is a system of exercises, which is first and foremost aimed at health preservation and healing. We stand upright with legs closed. Now we sink the centre of gravity, pull the fists to the waist and step to the left into the horse stance. Then we rise a bit and press both hand edges forward. Now we form fists and pull them apart while turning leftwards to the back as if we wanted to shoot an arrow from a bow into that direction. The right foot turns on the ball simultaneously. Then we open the fists and turn back to the front with the palms facing downwards. We close the legs and return to the starting position. We repeat the exercises mirror-inverted to the other side. Repeat in total four times to each side. We stand upright with legs closed. Then we form sword fingers with both hands and lead them towards the body at breast height. Thereafter we turn the sword fingers outwards and lead them completely to both sides. While doing so the sword fingers are pointed upwards. Then we pull the left sword finger to the left ear. Now we reach out with the left arm to the side and at the same time we pull the right sword finger to the right ear. This movement can be repeated alternately as long as we wish to. Then we dissolve the sword fingers and lead the arms back into the starting position. This exercise is executed relatively energetic, whereas the body slightly turns following the arm movements. This exercise supports the function of the liver and stretches the sinews in the shoulder girdle as well as in the torso.